Four scientists and a rich guy use Movie Excuse Number Seven to go up in the rich guy’s space station where they are all engulfed in Movie Convention Number Twelve (see “cosmic storm”) which gives them super powers. While using Movie Explosions Numbers Six through Twenty-Four, a story emerges as the Four scientists turn into Movie Stereotype John Wayne (i.e. do-gooders) with the rich guy succumbing to Movie Convention Three-dash-Lucas (The Dark Side of The Force).All the while forgetting to do Movie Rule Number One: Act. 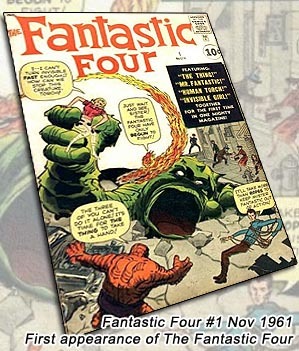 The Four’s powers allude to the “four elements” of Earth (Ben Grimm/Thing), Water (Reed Richards/Mr. Fantastic), Fire (Johnny Storm/Human Torch) and Air (Sue Storm/Invisible Girl). Lee ramps up the personal interaction between this superteam by making two of them siblings, with Ben as Reed’s bosom buddy and Reed as buddy to Sue’s bosom. Mark Frost and Michael France deliver a script which strives to capture familial Movie Convention X (see “X-Men”). And fails. Tim Story directs using the Basic Colorful Explosion Movie-Making Guide but not even Jesus Christ and his reindeer can help the production if no one actually ACTS. The Four suffer the same un-fantastic fate of Eric Bana in HULK – most are reasonable actors stuck in roles which afford them no time to reach (or do second takes), as the budget had to be funneled into hedonistic advertising, explosions, electrical “bzzz” things and pretty orange effects for the Human Torch. The Four’s origin deviates from comicbook canon, but they arrive at their powers nonetheless. British Ioan Gruffudd, a brainiac who gives “stick in the mud” a bad name, turns into the stretchy Mr. Fantastic and expresses his love for Sue Storm by staring blankly. Jessica Alba is Sue, supposedly a hottie (presumably due to her chest resembling smuggled cantaloupes), her hotness negated exponentially against her acting prowess, which is nil. Add that mannequin demeanor, ugly hairdo and her privileged, enabled big-lipped bitching and she might as well be a squat mother of five with a mustache thicker than the one on her husband’s arse. I mean, has anyone looked past those rounded ta-tas when offering Alba a job? While being bombarded with rays to become the Invisible Girl, she poses dynamically, looking like she’s acting as if she’s posing dynamically. That oughta land her the Don Cheadle Award for Most Embarrassing Fake British Accent Of All Time. Her powers include bending light into tangible force shields and manipulating it to become invisible – did you hear what I said? She can bend light into tangible force shields and manipulate it to become invisible – yet all she’s worried about is that someone might see her squat Latino body when she takes her clothes off to disappear. Michael Chiklis (THE SHIELD) inhabits the orange rockslide of The Thing with as much heart as can be mustered under three hours of makeup. Ben’s “great love,” Debbie (Laurie Holden), proves the worth of her marriage vows (especially that part about “for better or worse”) by running screaming from him when she sees him, unheeding of his beseeching her for help and understanding. Ben eventually ends up with Alicia (Kerry Washington), a blind girl who is turned on by geological strata evidently, as she feels Ben’s face and inexplicably makes a sensual connection. Australian Julian McMahon (son of former Australian Prime Minister, William) is Victor Von Doom, the rich guy. He turns into metal, which, unlike rock, air, fire or liquid, is apparently an “evil” substance, thereby able to shoot “bzzz” things out of his hands and causing the Fantastic Four to pose dynamically to overcome him, all to the strains of an exceptionally insipid soundtrack. Maybe it’s me, but when Doom puts the metal mask on, I was kinda disappointed he didn’t sound like Darth Vader. Doom’s origin was screwy too, but at least he wore a nice cape. Superhero movies all make the mistake of trying to ‘splain in contemporary scientific terms what was originally nothing more than a comic book writer’s specious, fantasy-based origin tale – throwaway reverse-storytelling devices to allow the hero to function in his particular world with as little flashback as possible. FANTASTIC FOUR tries so hard to rationalize how their powers work scientifically that we end up staring blankly at Jessica Alba’s ta-tas. Oh, that’s what Ioan Gruffudd was doing! Writers: Mark Frost, Michael France, Stan Lee, Jack Kirby. Starring: Ioan Gruffudd, Jessica Alba, Chris Evans, Michael Chiklis, Julian McMahon, Hamish Linklater, Kerry Washington, Laurie Holden.